1) You’re still donned in glitter, makeup, fabric and plaster, and that’s just your head. Hallo’Tween is known for the cleverly clad, raunchily robed and gruesomely garbed costumes. 2) You woke up singing songs from Deb & the Dynamics’ set list. Recent years’ tradition has Deb & the Dynamics returning to the Hallo’Tween bash to get partygoers up and dancing all night long. 3) Your feet, legs and arms are killing you. Remember that Hocus Pocus scene where the parents can’t stop dancing? That was totally you last night. 4) You’ve got $1000 burning a hole in your pocket. Yep, you read that right. The zaniest and best costume clad contestant receives a grand prize of $1000. Innsider Tip: Make your reservation ASAP to spend the night. After a night of spooktacular fun, you won’t want to drive home. 5) You saw both the sun set and rise at ‘Tween Waters Inn. 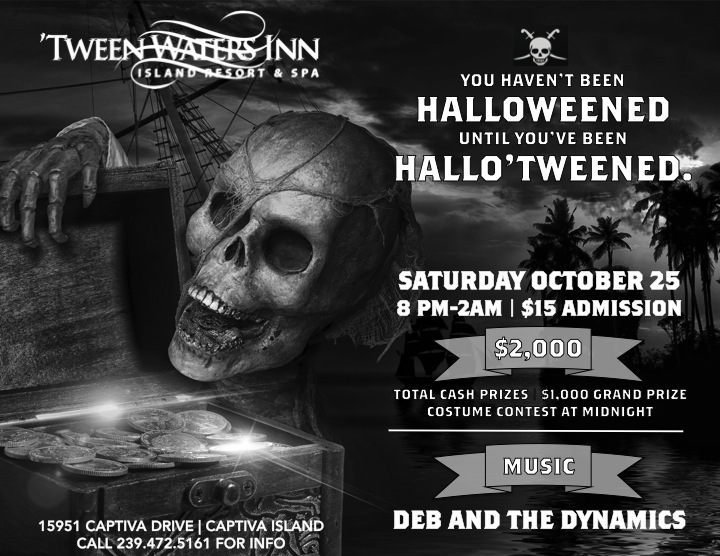 Events start at 8PM at ‘Tween Waters Inn, but you caught the sunset while prepping the perfect costume and the sunrise at your personal little after party. 6) You’re still facedown in your hotel pillow. You booked your hotel room in advance and got a great deal on a Bayside studio, and with check out at 11AM, you’re still hitting the Zzz’s hard. 7) Your camera roll looks like it was on the set of The Hangover. You might have gone a little crazy with the camera this year, snapping photos of strangers dressed in everything from Pharrell’s hat to a bath pouf. Hey, what’s that tiger doing in your photos?! Whether you partied too hard, or maybe just right, the memories, or lack thereof, of this year’s party were legen…wait for it…dary. Legendary.